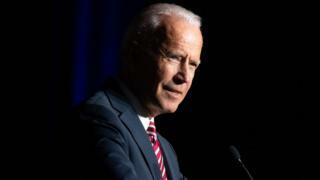 A second woman has accused former US Vice-President Joe Biden of inappropriate touching, as the leading Democrat mulls a White House bid. Amy Lappos said Mr Biden had touched her face with both hands and rubbed noses with her a decade ago. The allegation comes after another women, Lucy Flores, said Mr Biden kissed her on the back of her head at a campaign event. Mr Biden has said he did not believe he has ever acted inappropriately. The former Delaware senator, who served as Barack Obama's vice-president in 2009-17, is seen as a possible front-runner in the race for the Democratic presidential nomination. Some leading Democrats have publicly supported Ms Flores, while House of Representatives Speaker Nancy Pelosi said the allegations should not rule out a 2020 run. What do Mr Biden's accusers say? Ms Lappos, a 43-year-old former aide to a Democratic congressman, said Mr Biden touched her inappropriately at a fundraiser in a private home in Hartford, Connecticut, in 2009. She told the Hartford Courant the then vice-president entered the kitchen to thank a group of aides, before wrapping both hands around Ms Lappos' face and pulling her in to rub noses with her. Ms Lappos called on Mr Biden not to run for the White House, saying: "Uninvited affection is not okay. Objectifying women is not okay." Ms Flores' allegations first appeared on Friday in an article she wrote for The Cut magazine. Ms Flores was running as the Democratic candidate for Nevada's lieutenant governor in 2014 when Mr Biden flew in to support her bid. As she prepared to go on stage, Ms Flores say Mr Biden placed two hands on her shoulders from behind, smelled her hair then planted "a big slow kiss on the back of my head". How has Mr Biden responded? Asked about the new allegation, a spokesman for Mr Biden referred reporters to a statement he issued on Sunday. "In my many years on the campaign trail and in public life, I have offered countless handshakes, hugs, expressions of affection, support and comfort. And not once - never - did I believe I acted inappropriately," it read. "But we have arrived at an important time when women feel they can and should relate their experiences, and men should pay attention. And I will," he added. Mr Biden and President Obama were known for their close friendship, often seen playing golf and attending sports events together. Mr Biden even said that Mr Obama offered him financial help when his son was ill.
For his vice president's birthday in 2017, Mr Obama posted a photo of the two of them on Twitter, writing that Mr Biden was his "brother and the best vice president anybody could have". On Monday a spokesman for Mr Biden also accused "right wing trolls" of presenting harmless images of the former vice president interacting with women over the years as evidence of inappropriate touching. Former Vice-President Joe Biden's reported behaviour is what used to be described as "touchy feely". He is known to be physical, with everyone. He is also known as one of the most empathetic politicians around - the guy who calls when you have a problem, and just listens. But now two women say the "touchy" behaviour was a problem and the "feely" behaviour was inappropriate. This needs context. Physical contact with supporters has been a necessary part of political campaigning for decades. The candidate who tries to run for office and refuses all physical contact with voters would soon be dismissed as cold and aloof. So clearly there's a line politicians have to walk. Physical but not in the wrong way. And I'd posit that most women know exactly which side of the line any physical contact falls on - appropriate or inappropriate. We just know it. And women my generation put up with inappropriate contact for years, assuming it was part of the cost of having a job in a largely male environment. Younger women are less tolerant. Thank God. They have much less tolerance for men behaving badly. In many ways this is a story of generational differences. A number of candidates for the 2020 Democratic presidential nomination have backed Ms Flores. Senator Elizabeth Warren said Mr Biden "needs to give an answer", and Senator Amy Klobuchar said that in politics "people raise issues and they have to address them". Asked how the allegations might affect Mr Biden's possible future presidential bid, Ms Pelosi told Politico: "I don't think it's disqualifying." But she added: "He has to understand in the world that we're in now that people's space is important to them, and what's important is how they receive it and not necessarily how you intended it." Support for Mr Biden was voiced by Cynthia Hogan, a former aide to the vice-president, who told the New York Times that he "treated us with respect and insisted that others do the same". 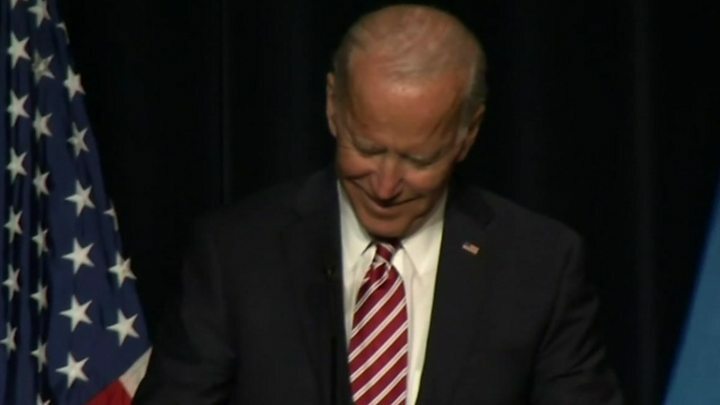 An ally of Mr Biden told CNN he was not reconsidering a run for the White House following the allegations but stressed he had yet to make a decision. Mr Biden has yet to jump into the race, but plenty have. So who else has a shot at becoming the next president?